If it is dark, then the two motors run at full speed. If a sensor detects light, it slows down the motor on the same side. So, if the right sensor detects more light than the left sensor, the right motor turns slower than the left one. That makes the vehicle turn right to the light source. 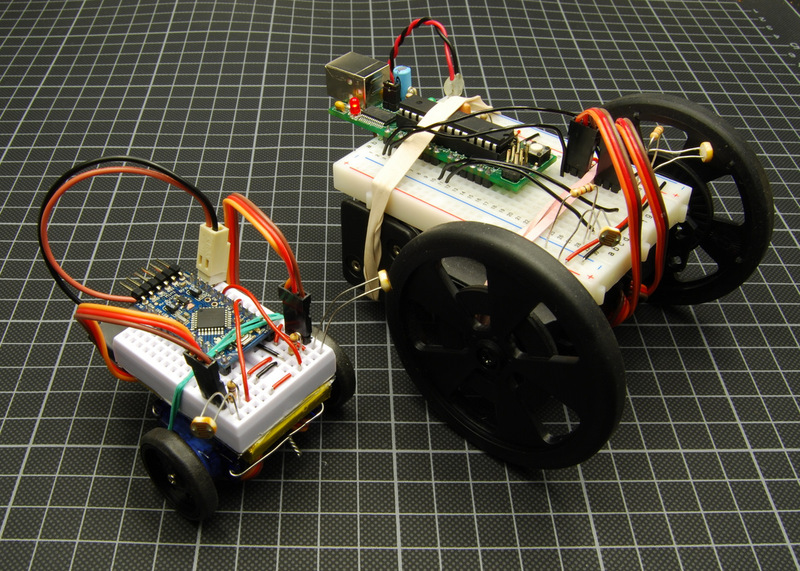 If it is bright enough, both sensors will stop both motors. I picked the Arduino Mini Pro because of it’s size and because it runs at 3.3V, a good match with the 3.7V lipo cell. The lipo cell has about the same size as the mini breadboard. The two servos are hacked for continuous rotation and tied together, bottom to bottom with a piece of wire. 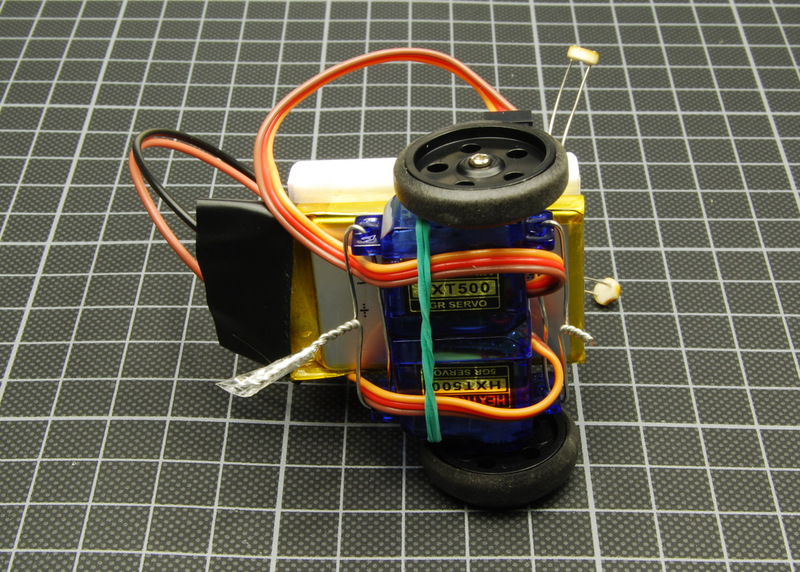 Although most servos are rated for 5V, they work great with 3.7V. Maybe they run a bit slower. The values are determined by experiments. Yours may vary. Here is the mini next to his older brother. The space on the mini breadboard is really limited, but it just works out. Still no soldering required, if you don’t count the servo hacking. What’s next? Hm, pager motors? 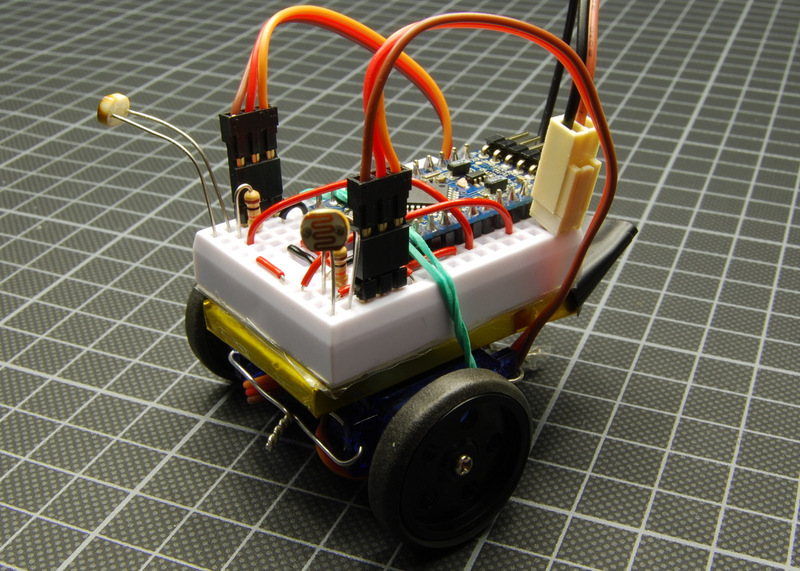 This entry was posted in Arduino and tagged braitenberg, robot by alex. Bookmark the permalink. Can you post the code you used for programming? I would like to do this too. Thanks. I updated the post. Enjoy. I have tried this, and it does not work at all. Here is how I have it connected… 3.7v to vcc, gnd to gnd – also goes to a bus grounding both motors. Power goes from the battery through each eye, then a resistor to the gnd bus. The pwm of each motor is connected to pin 9 and 10, respectively. Between the eye and the power it is connected to pins a0 and a1. All my connections look just like yours, I believe. the board powers on, but will not move the robot. the servos function as well if you apply power directly. Sorry for the questions, but I am new to this, and I really liked your example. just write a loop for the Arduino, that sends value 70…120 to the servo motors. For the LDRs, just print out the values you receive. With this you should find out, why the motors are not working. how to feed program in the given IC?